January 30, 2016. 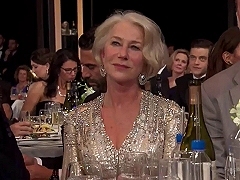 Helen Mirren was nominated as Best Actress for Woman in Gold as well as Best Supporting Actress and as part of the Best Ensemble for Trumbo. January 18, 2014. 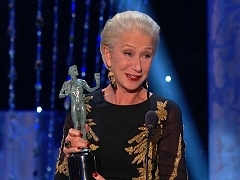 Helen Mirren won Outstanding Performance by a Female Actor in a Miniseries or Television Movie for Phil Spector. January 27, 2013. Helen Mirren was nominated as Outstanding Performance by a Female Actor in a Leading Role for Hitchcock. January 28, 2007. Helen Mirren won Outstanding Performance by a Female Actor in a Leading Role for The Queen and in the television category for Elizabeth I.
February 22, 2004. Helen Mirren was nominated as Outstanding Performance by a Female Actor in Television Movie or Miniseries for The Roman Spring of Mrs. Stone. January 30, 2016. 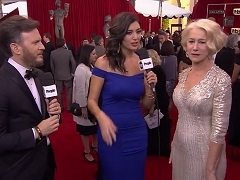 Helen Mirren is interviewed on the red carpet at the 22nd Annual Screen Actors Guild Awards. January 18, 2014. Helen Mirren is interviewed in the press room at the 20th Annual Screen Actors Guild Awards after winning Best Actress for Phil Spector. January 28, 2007. Helen Mirren is interviewed in the press room at the Screen Actors Guild Awards after winning for both Elizabeth I. and The Queen. January 18, 2014. 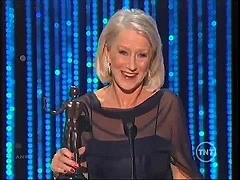 Helen Mirren is interviewed after winning a Screen Actors Guild Award for her performance in Phil Spector. January 23, 2010. 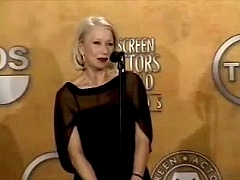 Helen Mirren is interviewed on the red carpet at the Screen Actors Guild Awards, being nominated for The Last Station. January 28, 2007. 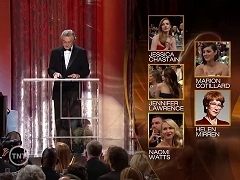 Helen Mirren is interviewed at the Screen Actors Guild Awards after winning two awards for Elizabeth I. and The Queen. January 28, 2007. Helen Mirren is interviewed on the red carpet at the Screen Actors Guild Awards before winning two awards for Elizabeth I. and The Queen.